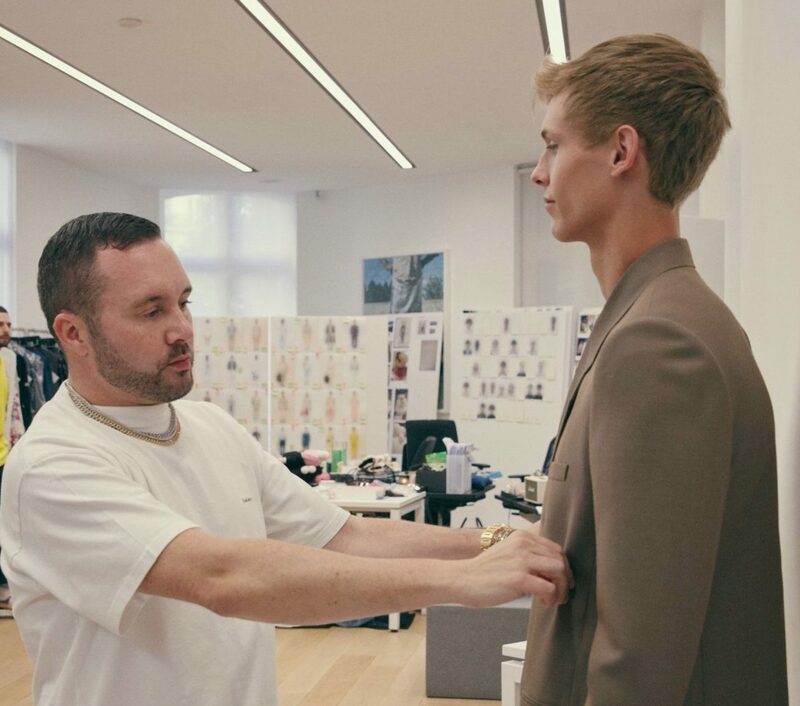 Dior demonstrated a good understanding of the times when it appointed British designer Kim Jones as artistic director of the men’s collection last year. A graduate from the prestigious Central Saint Martins College of Art and Design, Jones comes with an illustrious provenance that includes work for high-profile brands such as Topman, Alexander McQueen, Alfred Dunhill and, most notably, Louis Vuitton, where he revolutionised the house’s menswear by injecting his distinctive mix of high fashion and street style. In addition to pioneering a new style for the brand, Jones also helped kick off the “athleisure” movement that the world has come to embrace so dearly. Translating a quintessentially feminine couture identity into a masculine idiom results in clothes that are softer, with rounded shoulders and eased shapes. A slashed cowl is added to the back of shirts, exposing the nape of the neck. A new Dior jacket, the Tailleur Oblique, wraps the body in a diagonal line, a subtle reference to the shape of Monsieur Dior’s Autumn/Winter 1950 collection. It is executed in featherweight cashmere and summer mohair, as well as in the British wools beloved of Christian Dior for his own wardrobe and those of his clientele. Combining tradition with modernity, Jones fuses references to haute couture with sportswear, representative of contemporary masculinity. 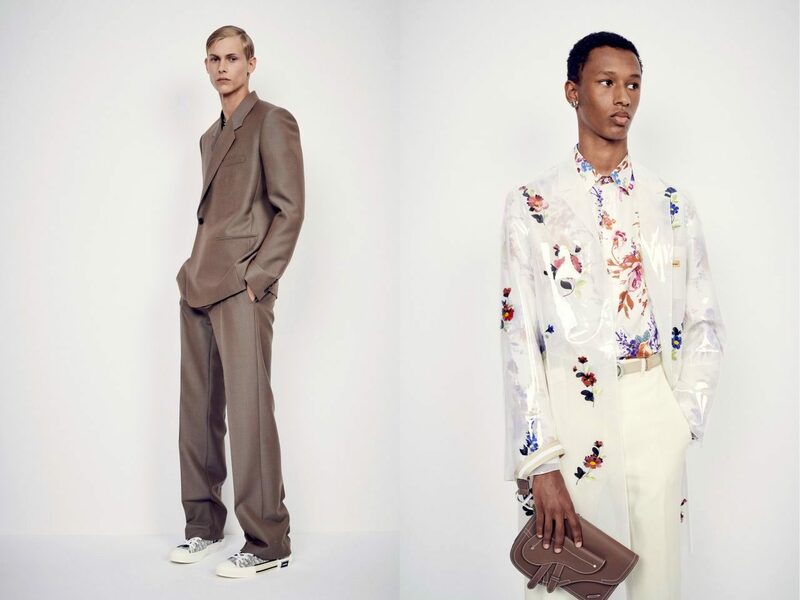 The summer 2019 collection also references an almost secret history of Monsieur Dior. His dog, Bobby, who inspired a limited edition of the Miss Dior perfume bottle, makes a witty recurring motif. The jewellery introduces a new modernist logo derived from the one used for the Dior family’s business ventures in the 1920s; an embroidered cipher comes from the announcement of Christian Dior’s birth in 1905. Accessories also draw on the inimitable Dior heritage. The emblematic Dior Saddle bag is interpreted for the first time for men, offered in cross-body, backpack and belt-bag styles. It is even reappropriated as pockets on ‘archive’ leather jackets. An embroidered version of the toile de jouy features on leather goods, alongside other Dior codes — the cannage pattern laser cut in leather, the Dior Oblique canvas in a new tricolor variation. Christian Dior stated that his identity as a couturier was actually not one man but many – a composite of people. Jones draws on this same sense of community for his debut: Yoon Ahn of Ambush has created the jewellery, employing Dior emblems such as the neoclassical ‘CD’’, flowers and insects; Matthew Williams of 1017 ALYX 9SM has designed a new metal buckle, used on accessories. Stephen Jones has created millinery based on original ‘Christian Dior Monsieur’ pieces, found in the house’s archives. Dior men artistic director Kim Jones takes the time to answer our questions below. Since joining Dior, what have you discovered to be most inspiring or fascinating, or valuable, about the brand, its rich history and the late Mr Dior? The whole archive and heritage at Dior are incredible and the respect for it is so great, it inspired me to keep building the legacy. I’ve used the House colors and patterns and taken pieces from Mr Dior interiors and family archive as a reference, but I also looked at Mr Dior’s personal life. The floral motif comes from Monsieur Dior’s dinner services. They echo both Monsieur Dior’s love of nature, and his “femmes-fleurs”, we just blew them up and made them into prints because Mr Dior was famously into his food as well. His dog, Bobby, inspired a limited edition of the Miss Dior perfume in 1952. And, then, the Toile de Jouy which is actually the one from the first store that Monsieur Dior did in 1947 and it’s embroidered under en toile of tulle and organza. 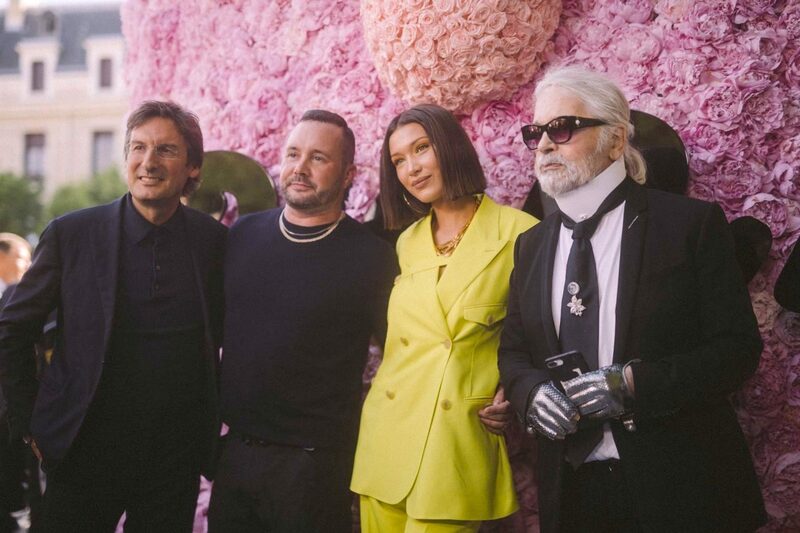 From left: Pietro Beccari, Kim Jones, Bella Hadid and the late Karl Lagerfeld at the Dior men Spring/Summer 2019 fashion show. I think Dior pink and Dior grey are two colors that symbolise the Maison. When I joined Dior I was asked to “Give it more colour, more energy!”, so I used these two symbolic colors in particular. We chose pink as one of our main colours because it was used in women’s gowns during our Maison’s founding era as well as in in Monsieur Dior’s family home. And for anyone who thinks pink is not a men’s color, I encourage you to go to Los Angeles. There are tons of kids on the street wearing pink! You mentioned about a return to elegance and the Dior tailoring. Here we have an atelier; tailoring is much more prominent here. This collection is energetic, very tailoring, respectful to the House, and referencing Mr Dior’s personal world and life, but for 2019! The silhouettes are fluid, sophisticated and comfortable. The collection is actually really chic and elegant because that’s what this Maison is like. So, it was taking what the House has done, which is couture and tailoring and using that into making the new stuff. I’ve always wanted to work with KAWS, I think he’s super chic and also his work speak to a lot of people. So that’s what I wanted to do. I’ve grown up loving KAWS but now he’s like one of the major artists of his generation and it’s for everybody really. 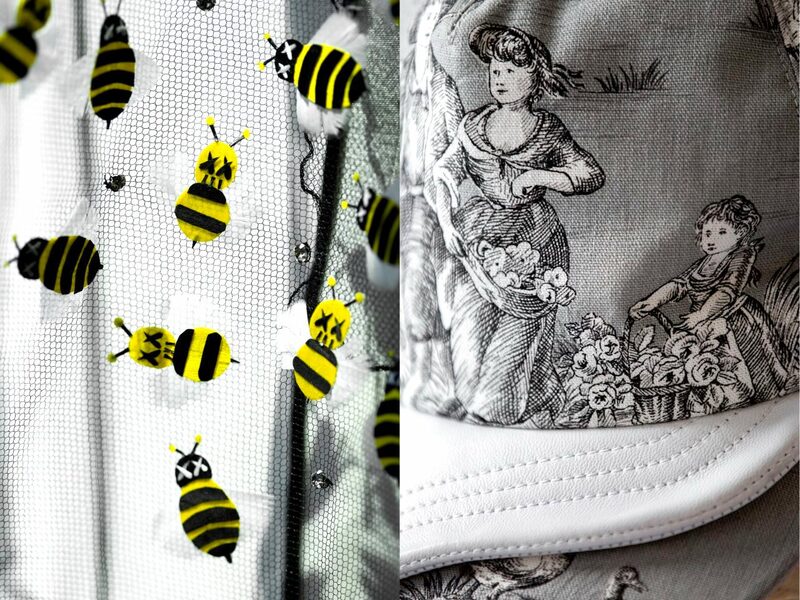 I wanted an element of surprise there, so we commissioned KAWS to redesign the iconic bee, a Dior house code. We did Mr Dior as the BFF KAWS character with his dog Bobby, I’d wanted to make this show into something massive, and it was a huge success with KAWS. Dior is a large company, but the staff really respect each other, and the Maison has a warm family-like atmosphere. KAWS really fits well into that. 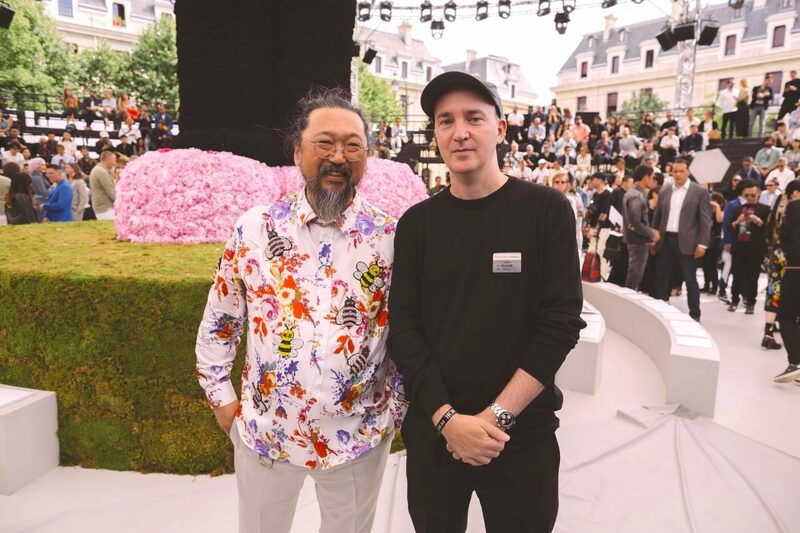 Takashi Murakami and KAWS at the Dior men Spring/Summer 2019 fashion show. Your expertise in combining luxury and sporty, casual styles has resonated among the younger generation.